The rift between the Gülen movement and Turkey’s ruling party is widening, says DAVID TITTENSOR. 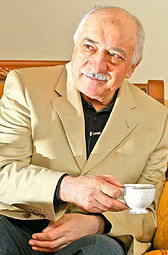 The Gülen movement, which its 72-year-old founder, retired imam Fethullah Gülen (pictured), denies is even a movement, is both political and not political—that is, it is not a political party and, to date, appears to have no intention of making the transition from being a social-religious movement to the hustings. Prime Minister Erdogan: visiting Gulen schools. While it remains apolitical in the formal sense, the Gülen movement has no qualms about providing support for the political party that is consonant with its values. This was very much the case with Turgut Özal’s Anavatan Partisi(Motherland Party) after the 1980 military coup. Özal—a follower of the Naqshibandi Shaykh Mehmet Zahit Kotku (1897–1980)—provided an effective political climate in which the Gülen movement could operate. He lifted a ban on Fethullah Gülen’s preaching, as he wanted to use the imam’s ideas as a countervailing force to radical Islamic groups, and liberalised the education sector, which allowed the movement to marshal its capital and open private schools and preparatory schools that have become the backbone of its global empire. The situation was much the same when the ruling Adalet ve Kalkınma Partisi (Justice and Development Party, AKP) achieved power in 2002. Although the Gülen movement and the AKP have emerged from different Islamic, strands—the AKP from Necmettin Erbakan’s more right-wing MilliGörüş (National View) movement of the 1960s and 1970s, and the Gülen movement from a civic Islam inspired by Said Nursi (1876–1960)—they have converged in a number of areas. Both are pro-globalisation and market liberalisation, and both wanted to free Turkey from the military tutelage that has regularly suppressed both movements and create a more conservative Muslim society. This has seen the AKP support many of the Gülen movement’s educational endeavours in Turkey and abroad, with the president, Abdullah Gül, and Prime Minister Recep Tayyip Erdoğan either visiting Gülen schools overseas or praising their efforts. Recently, however, the AKP and the movement have begun to have significant disagreements. These first surfaced in 2010 with the Gaza flotilla incident in which the Turkish ship Mavi Marmara, organised by the Turkish non-government organisation, the İHH Humanitarian Relief Foundation, was attacked in international waters by Israeli commandos, while trying to break the Gaza blockade.Nine people on the Mavi Marmara were killed, eight of whom were Turkish nationals. Erdoğan responded forcefully, calling the attack a ‘cause for war’. He expelled the Israeli ambassador, imposed sanctions and suspended all military agreements with Israel. In contrast, Gülen was pro-Israel, possibly in line with his interfaith dialogue advocacy. He stated that the attempt to break the blockade was ‘a sign of defying authority, and will not lead to fruitful matters’, and added that it was ‘out of the question to call these people martyrs. They knew they were going there to get killed and went at their own discretion’. The conflict between Turkey and Kurdish insurgent groups is another area of disagreement between the Gülen movement and the AKP. Gülen takes a more hardline approach, indicating that the Kuridstan Workers’ Party (PKK) is not trustworthy, while the AKP is keen to negotiate a solution to the conflict. Illustrative of this rift was an attempt, in February 2012, by the Public Prosecutor’s Office, to interrogate Turkey’s intelligence chief, Hakan Fidan, one of Erdoğan’s closest allies, over efforts by the National Intelligence Agency (Milli İstihbarat Teşkilatı-(MİT) to broker a peace with the Kurdish insurgents. The PKK has reportedly been targeting Gülen institutions as they are seen to be ‘stealing’ potential Kurdish militants, and it is alleged that the movement instigated the interrogation of Fidan because of the MİT’s attempts to broker peace with the Kurdish rebels. Erdoğan retaliated by initiating a law to shut down dershanes (preparatory schools)—the movement runs approximately 1600 such schools in Turkey. The investigation has already seen three cabinet ministers forced to resign and brought to light allegations of massive money laundering, bribery and fraud. The move to shut down the dershanes, which provide the movement with a significant revenue stream and employment network, is a particularly significant blow, and provoked a return blow—allegedly, the instigation by the Gülen movement, in December 2013, of a corruption investigation against the AKP. The investigation has already seen three cabinet ministers forced to resign and brought to light allegations of massive money laundering, bribery and fraud. It also has the potential to entangle Erdoğan’s son, Bilal, after the release of wiretapped conversations in which Erdoğan’s purportedly urges his son to hide money stashed in a number of properties. This, in turn, has seen Erdoğan purge the judiciary and the police force of suspected Gülenists. Pundits have labelled the movement’s latest salvo a significant challenge to the government. Erdoğan, however, has dismissed the allegations as a ‘dirty operation’ that is the work of a ‘parallel state’—an apparent veiled reference to the Gülen movement—and that, in future ‘there won’t be a state within a state. We will root them out’. So far, the scandal has not had the effect desired by the Gülen movement. The AKP passed a recent litmus test in March by winning about 45 per cent of the vote in local elections—although there have been allegations of vote rigging. Nevertheless, the win indicates that the Gülen movement—despite its claimed 3 to 4 million followers—has had minimal impact on the election outcome, suggesting that things are far from the lose–lose situation for the Islamist camp as a whole suggested by some commentators. Rather, the result indicates—presuming Erdoğan’s allegations about the Gülen movement’s ‘dirty operation’ are true—that if the movement has indeed engaged in some hard politicking, it is likely to come off second best. This is particularly the case if Erdoğan follows through with his threat to extradite Fethullah Gülen, who has lived in self-imposed exile in the United States since 1999, and has been granted permanent residence status there. However, given the support from influential Americans that led to Gülen obtaining his residence status, such an outcome seems unlikely. Anti-PKK demonstration: The conflict between Turkey and Kurdish insurgent groups is another area of disagreement between the Gülen movement and the AKP (Wikimedia Commons). Dr David Tittensor is a research fellow, Centre for Citizenship and Globalisation, Deakin University, and the author of The House of Service: the Gulen Movement and Islam’s Third Way, New York: Oxford University Press, 2014.